Hash signs would be inapproapirate for theis location. Any hashers who are unsure of the location merely drive around the north of Chichester unitl they hear the groans of the neighbours crying "Not that lot again! Is it New Year already? So the usual suspects gathered at Freeman Towers to greet two new hashers - small Paul brought along by Selwyn ( I say small because he is Paul and he is smaller than Mussolini) and also a comrade from the Moscow Hash. The remaining hare told the usual lies including one that the other hare had gone for a lie down (when some of us had seen him and his bike rushing off to lay a last minute trail) and then asked us to go and find the trailwith not even a vague indicationof where that maybe found. With only two choices of direction some of the hashers made the correct decision and ran a very long trail to the first false which used a cunning back track to fool the pack. 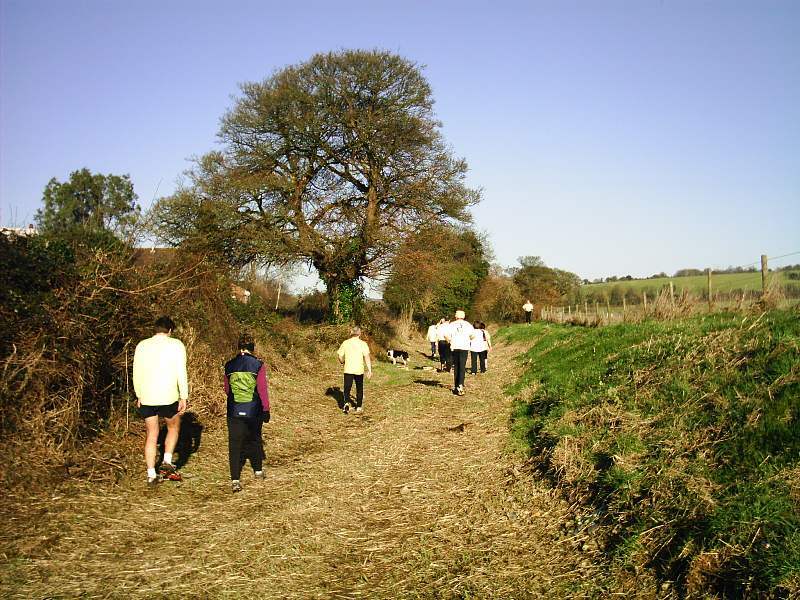 The pack were directed across the fields to Lavant and then across the road and along the path up towareds the Trundle. It was here that various cheats and tricks were tried to fool this keen bunch of finely hone athletes. They all succeded. And who else succeeds? A budgie with no teeth! Sorry still in Xmas cracker mode. As the pack got to the end of the road they were sent around in a big circle before coming back to the place they had started from only a few minutes before. So the pack were run out and then turned around before being regrouped back at Lavant to cros the road. It was here that Catherine held the pack up so that she could apply fresh lipstick. This is important to teenage girls (no really it is...) Make up done we crossed the road and found the path leading back to the end of the lane behind Freeman Towers and then the more expereinced or those who could just smell the beer began to head for home. It is to their credti that year after year the pack gather at this spot and run the same area and are still fooled by wily trail laying. Or alternatively it could be that hashers as a breed are exceptionally stupid. Which is true? So the pack began to dribble in and changed into resectable attire (well as respectable as this pack ever gets - a kilt Robin?) before delving into the food and drink laid out before them. The JMs called for nominations for hashit but it was really no contest as the entire Barty family had it sewn up, Dad for splashing daughter, Mum for producing daughter and daughter for applying make upduring a run. Were they guilty? The JMs then performed their final task of awarding haser of the year to Rasta (and not just for being married to Old Faithful) before handing over to the new JMs - Mr. Bean and The Can Man. The Can Man gave a short inspirational speech before getting on to the most important event of the year the hash raffle. There were the usual wonderful presents of chocs and booze as well as the more ingenious ones such as pot plants, Hungarians CDs and a magnificent piture of a cactus grown in a rude shape. True to form a lady was seen to covet this item and took it home with her. So after the pies, the prizes and the usual greetings to all we departed for our homes ready for yet another hashing year.